A cross between Saw, Clue, and Cabin in the Woods, this house of traps kind of movie has great concepts, but would have benefited from a little more explanation. There’s a very cool concept here, where a bunch of strangers meet inside a weird cube structure, which is a series of rooms filled with deadly traps. And they need to travel from one room to the next. It’s a fantastic setup. The traps are cool and the sets look terrific. But the story doesn’t really go much further. We spend the movie watching the characters lose their sense of humanity and turn on each other, and all of that is fine, but what we really want are answers. Why was the cube built? Who but them there? What do they all have in common? Questions like that really don’t get answered. So if it’s about turning off our minds and curiosity and just embracing the artist level of what’s in front of us, then yeah, this thing is great, but in terms of storyline it is definitely lacking. Cube is a pretty wild movie. It’s the kind of film that exists by using the very basics of a house of traps movie and then slowly elaborating on it. Instead of a house, it’s a giant cube that the characters are stuck in. What that means, in fact, is that it’s a series of cubes, each one connected to the next. Each cube is basically a room with colored walls and six hatches…one on each of the four walls, plus one on the ceiling and one on the floor. The characters need to go from one of these rooms to the next in order to find the exit of the structure they are in and get out. Sounds like an adventurous fun house, right? Only there’s a problem. Many of the rooms contain a deadly, gruesome trap. Not all of them. And figuring out how to detect the trap is not exactly easy. At the start of the movie, we see a character moving carefully from room to room. Everything seems to be going well, until he is sliced into pieces and falls apart. That’s when we see the device that cut him up, a wire grid that swings out without him even knowing it’s there. His death marks a graphic image which lets the viewer know what is in store for the ride through this movie. Now or we meet a handful of characters who are all waking up in a room with each other. There’s Quentin, the cop with a lot of rage. There’s Worth, the mysterious dark guy who keeps quiet. There are also two women. Levin is the attractive young girl who is a mathematician. And Halloway is the older, wiser woman who has conspiracy therories about everything. If Levin is the innocent, naive one, then Holloway (a doctor,) is anything but. And there’s a final character in the room with them, a much older man named The Renes, who seems to have it all figured out. The Renes is actually an escape artist. He has escaped from a ton of different prisons and is well-known. Quentin recognizes him and tells the others of this mans reputation. The Renes isn’t much for conversation. He seems to know what he’s doing, using the shoestrings on a pair of boots to throw a boot into a room, check is the room is trapped, and then pull the boot back out. This works for him up until one rooms trap is set to go off if the temperature or air in the room changes, and Renes suffers the consequences. Acid shoots out at his face, causing his entire face to crumble in and break apart. So much for the escape artist. The characters quickly realize there’s no full proof way to know if a room is trapped. So they look for other clues, besides trying to fool the traps into going off. Levin notices that each room has a series of numbers, and she decides a theory. A room is safe if the numbers on the hatch are prime. When that turns out to not be true, it’s if the numbers can be divided by a prime number. Then it’s something else. The math angle is annoying. At one point the group starts calculating hiw many rooms are in the cube structure, and exactly how big each room is. It all feels like a giant math problem. Luckily, it isn’t long before things get interesting again. Quentin gets Worth to open up about who he is and we learn that this guy actually has some insider knowledge about the cube. Only not really. You see, he’s one of the guys who built it, or came up with the design. Only he doesn’t know anything about who hired him or what it’s for. So basically he knows nothing. It’s one of the most wasted opportunities imaginable. With a movie like this, about an elaborate situation that’s rigged a certain way, we want answers. We want to know who rigged it and why. What would Cabin in the Woods have been if it was a movie with a ton of monsters and recording devices all over the cabin, and trap doors, but no explanation of what those things were doing there? As the characters go on, they come across a mentally handicapped man, who is also trapped and wandering around inside of the cube. Quentin wants to leave the guy. Halloway refuses. The others fall somewhere in between. They say things like, “let’s leave him now and then come back for him later.” But Halloway knows better and calls them out on it, asking if they would really ever come back for him. And so this guy, named Kazan, comes along with them, despite the fact that they can barely communicate or reason with him. At one point they go through a room where the trap is sound, and it causes all sorts of problems when bringing a guy who can’t help himself from making noises, into it. This is the single event that raises tension the most between the characters. Each of them climbs through the room carefully, making sure to not make a sound. Quentin goes last. And when its his turn, Kazan screams out. Giant spikes come shooting out of the walls, and Quentin jumps through the hatch below him, nearly being killed. Now he’s pissed. He goes after Kazan, Halloway gets in the way, and Quentin and Halloway have it out. At this point, there’s no holding back. She calls him a Nazi, and then ridicules him about what his home life must be like and why his wife and kids left him. Quentin gets so pent up with rage that he slaps Halloway in the face. In takes a while for things to cool off, but eventually they do, and the group keeps moving. Only Quentin is never really the same. From this point on, he becomes the villain of the movie. Now that’s both good and bad. On the good side, it’s important for these characters to quarrel and fight with each other, when stuck in such close quarters. It’s important for them to turn on each other. But by making one of them into the villain, and his being the villain having nothing to do with the cube, we start to lose focus of wanting answers about the cube. That’s what the movie is hoping anyway. It doesn’t work. The truth is, the real villain is whoever put them in this cube to begin with, and the movie should have known that. To use another example, what would the Saw movies be without Jigsaw? The characters in that film wake up in a men’s room, handcuffed to things, and if they never found out who put them there, it would be a much less satisfying movie. Cube should have been aware of that. 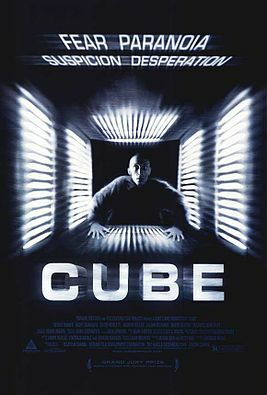 Cube is a movie with a fantastic initial idea, and some wonderful creativity in terms of traps and set designs. The way that each room looks different, only in its color, is a very cool concept. And the way that these characters wake up without knowing how they got there, is also pretty neat. Any movie where a bunch of stranger meet in a location they are unfamiliar with and find themselves trapped there, is a recipe for a cool film, going back to something like the movie Clue. And Cube has all that on the surface. It has the setup and even the start of the execution. Killing The Renes off early on is a terrific move. Both we and the characters felt like he was the greatest reassurance they had. But the problem with Cube is that it doesn’t push itself far enough. If they’re not going to give us answers about the Cube and its purpose, at least have the characters figure out what they have in common, or how they ended up there. This movie offers us none of these. On the one hand, I’m all for the idea that less is more, and the less you know, the more you have to imagine, and the scariest it is. But this movie takes that notion to a whole other level, giving us even less answers than we might have thought possible. The traps are cool and the ideas are cool, but the storyline definitely needed something more.